Our last night out in Florida we tried a place that had been recommended several times right down the street. 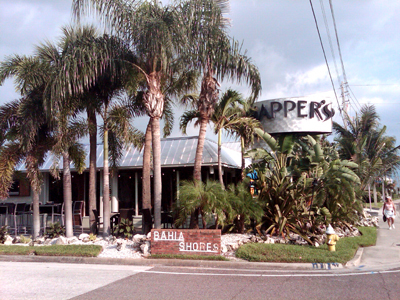 Snappers is well hidden by a grove of palm trees and I think we all drove by it once before pulling in for dinner. While everywhere else we had eaten had more of an Island bar feel, Snappers is much more high brow with fish themed stained glass windows, lots of polished wood, and a menu that uses many more words to describe the dishes. Watching other tables get their food it was obvious the plating is much fancier here, which is not always a good thing. So many times I have found the food quality goes down when people are thinking more about getting height on a plate. 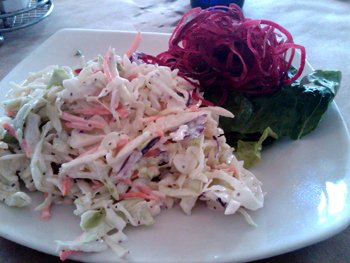 Fortunately, Snappers seems to take as much time considering how everything will taste. Our server was well trained and pretty efficient. 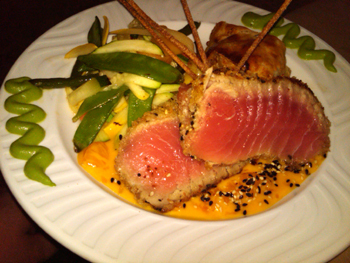 He took our orders for Wasabi Crusted Tuna, Blue Water Shrimp, Coconut Cashew Crusted Mahi Mahi, Pork Chops, and Stuffed Grouper. 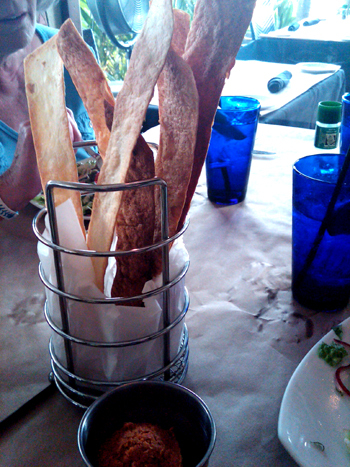 The table was given a stack of crisp thin bread strips which were served with a strongly spiced hummus. I think I was the only one at the table to like the hummus which was very intense. 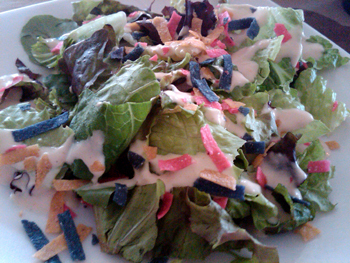 The house salads were a nice mix of greens with a pink dressing…yes they make almost everything pink in St Pete. Steph’s tuna was done to a T, although cut into two big chunks and when I snagged a slice it was really gummy, but she assured me that when sliced thin it was beautiful. My mother-in-law ordered something that worried me. 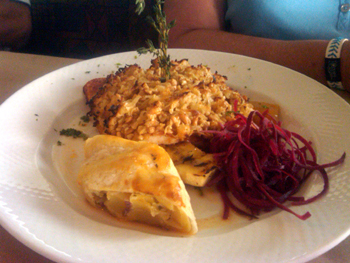 The mahi-mahi wasn’t the issue it was the accoutrement. The fish is served over a mango chutney with grilled banana! I mean, put the bong down, that sounds grotesque. Again, I am surprised, which has been an ongoing theme throughout this entire experience. The banana and mango put an extraordinary finishing touch to superbly done dish. 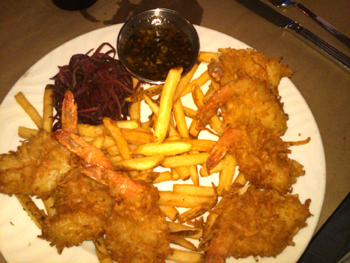 The most exciting and realistically the best dish of the night. Several of the dishes were accompanied by potato in puff pastry which appeared to be somewhat overwrought but was actually delicious. 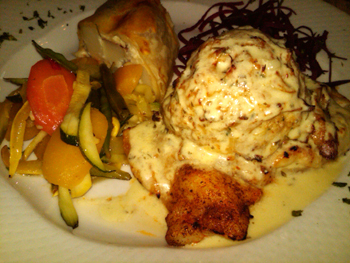 The puff pastry was crisp and flaky and the potato was buttressed with butter and sour cream making for incredible richness to balance the fish and beets. We opted out of dessert as I had been informed we were not returning to Ohio unless someone got another few bites of Key Lime Pie from Dockside Dave’s. Dave’s may have been my favorite on the trip but Snappers earned their way into a close second along with Ted Peter's.